Craig Tapscott: What have been the most enlightening experiences during your poker career when it comes to managing your bankroll? 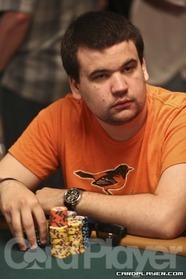 Christian Harder: Early on in my career I was staked by other successful poker players. It definitely helped jump start my career, letting me play a bunch of tourneys I was not close to being bankrolled for. I eventually succeeded enough to go out on my own. Later in my career I left my staking deals and would play on my own. If I did not feel comfortable putting up all of my own money into a tournament, I made sure to sell some of my action so that I would not have some of my decisions in the tournament be affected by the money. I have also invested in other poker players by staking them in tournaments or buying pieces, which I think is a smart thing to do. Amanda Musumeci: I’ll preface this by saying that I didn’t grow up with any money. It definitely was always an issue in my life and the lives of my family members. I’d always feared financial failure, and so I think I, even still, hold a lot of value in trying to salvage, maintain and appreciate my bankroll. By age 23, I was grinding online poker full time and had accrued a decent roll. To have a savings account and loaded poker accounts gave me an overwhelming sense of achievement. That sense of achievement, while amazing, also led me to have an immense fear of losing that which I’d won. I feared being a failure. I valued that bankroll a lot, and I was thankful that I’d won it. I was driven to make that roll last as long as possible. Eventually, I desperately wanted to start playing bigger buy-ins, but I knew I couldn’t afford it according to bankroll management guidelines. I decided to use my good results to find a backer. Backing and staking are key in managing a bankroll. Backing and staking have been the biggest catalyst in my success at managing a bankroll over the years. Vinny Pahuja: The main reason that the overwhelming majority of the high stakes community is backed is because most players just aren’t rolled for the stakes they play. And most players, who think they are rolled, in reality aren’t. As predominantly a live player, I think you should have a minimum of 75-100 buy-ins for live multi-table tournaments and 50-75 buy-ins for live cash. While these guidelines are conservative, I think if you have a significant edge in the game you are playing, you can be more aggressive when taking shots. I think smart, selective shot-taking is a much underrated skill and is essential if you want to move up in stakes. Game selection and bankroll management go hand in hand and shouldn’t be treated as mutually exclusive skill sets. Since I had a different career prior to pursuing poker as a serious source of income, I was a little more insulated financially than most young players who decide to go pro. Fortunately for me, when I started playing the live circuit in 2008, I started my career on an upswing. It allowed me to avoid pursuing a staking deal all together, and at the time I was pretty clueless about bankroll management and game selection in general. I had no clue about swapping, selling action, and the world of staking or backing. I just started buying into every $5,000 event because I thought that’s what everyone was doing. Little did I realize that downswings happen, and happen often, especially in live poker. Most of my first few years were a true learning experience, dealing with huge swings and learning how to reduce variance wherever and whenever possible. Craig Tapscott: Can you share the mistakes you’ve seen fellow pros or yourself make when it comes to managing their bankroll on and away from the felt? Christian Harder: Many of my peers who are very talented poker players have not exercised good judgment with their bankroll. Some of them let their egos get in the way and take shots in big buy-in tournaments with tough fields to attempt to get more recognition and the big score. It is very easy to quickly go on a bad run over the course of a year playing tournaments for a living on the circuit. Players should make sure to diversify their portfolio by playing in softer preliminary events, possibly swapping percentages with other poker pros they trust, and selling action for tournaments if they do not have the bankroll to withstand a downswing. You should always take in to consideration what your financial situation will be in the worst-case scenario if you happen to not cash in a few tournaments. Away from the felt, many players get caught up in the fast lifestyle that comes with being a poker pro. It is easy to get caught up in spending money on nice dinners and partying with your friends. Also many players, I think, have leaks outside of poker. The degenerate attitude can really come out causing players to lose their money by sports betting, or in the pit, or staking their mediocre friends. 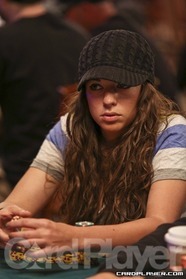 Amanda Musumeci: First, play within your bankroll. Follow the common rule of having 100 times the buy-in for a multi-table tournament, otherwise, don’t play it. The concept is simple. Poker has variance, highs and lows, ebbs and flows. We need to make sure that we are preparing ourselves for the times we don’t run or play our best. Second, use good game selection. Playing in fields with players with less skill is going to increase your profitability astronomically. Some of these series will have a day where they run a $1,000 and a $250 event, and you have to choose. Even as a staked player, you still want to play events that you know you will win on a more frequent basis. This is how you build a bankroll. Spending your time and investor money on tournaments that lack value given your skill set ends up hurting both parties. Third, don’t get a big head. If you do take a big shot and hit a big score, don’t go nuts on spending. I see this so often. We need to remain humble, and financially aware. Hitting one big score isn’t by any means an indication of our long term potential in poker. It’s probably best that we all prove to ourselves that we deserve and are skilled enough to play at a higher level before making any moves up. This is achieved with consistent results over time. 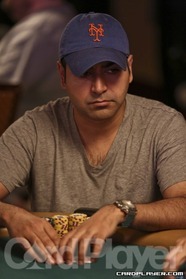 Vinny Pahuja: The biggest mistake I see other players make is underestimating the risk of ruin of their own bankrolls and overestimating their skill edge in whatever games they currently grind. We all have ego, but unfortunately, too many players allow their ego to affect their judgment. Ironically enough, even though I’m a better player today with a larger bankroll, I’m more conservative in terms of bankroll management. As we get older we tend to be less risk averse, but mainly I’m more conservative because the game is much tougher today. Today, I sell and swap out a bunch of action in each major event I play, regardless if I’m adequately rolled, because I’d rather just not deal with the swings. Even though I was reckless with my bankroll early on, I was fortunate to learn these lessons before going broke or overextending myself in other ways. Too many young players hit a large score and then immediately move up to the largest games they can find or stake a bunch of friends, etcetera. After you factor in taxes, swaps, and expenses, even a decent live score just ends up paying for lost buy-ins or a few tough months. We all know some great poker players who are constantly broke because they simply can’t manage their own money.